Sorry for being the slowest blogger ever. Between Kilter and coaching and setting and trying to climb I’ve been quite busy. In any case, coming soon we’ll post reviews for Escape, ENIX, and PUR holds. Til then, enjoy this recently recovered video of Spot setter Kevin Cuckovich sending Big Worm (V14?) last summer at Mount Evans. Nice one Kevin! Setting Update for June 25/26 and July 2 + New Setters + Videos! We reset the Right Dojo so now the whole Dojo has a new set. The crew for the right Dojo was Danny, Connor, Lily, and I, plus two new setters–Joel Zerr and Jake Novotny. We’ll add bios for them soon, but til then: Joel is a longtime setter and good friend of mine who has recently relocated from the Reno/Tahoe area, where he’s been putting up new problems outdoors, making videos for Asana, and helping with the new Tahoe Bouldering guidebooks. Jake is from Tahoe and also just moved here. 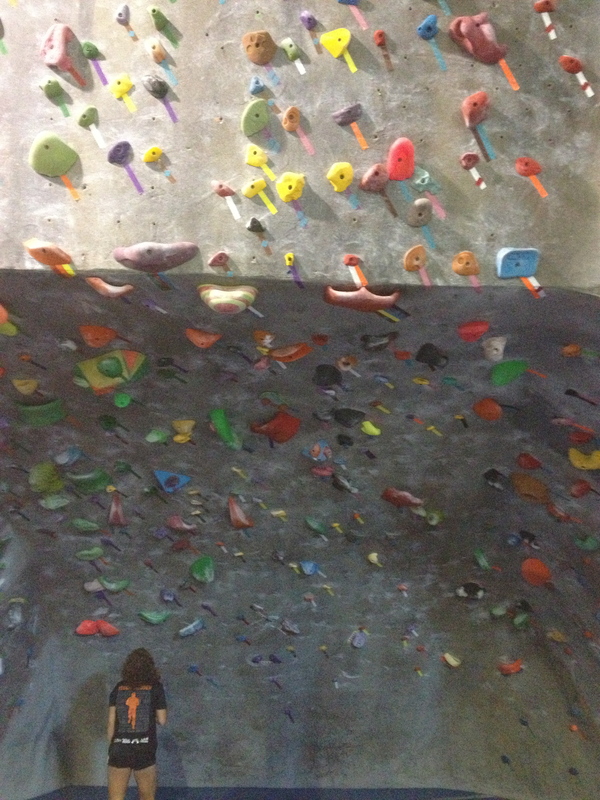 He used to be a motocross racer but he’s changed his focus to climbing and has been setting at High Altitude in Lake Tahoe. He will be setting with us through the summer at least and most likely for comps or perhaps full time in the fall. Check out their problems, they are labeled, JZ for Joel and JN for Jake, and let us know what you think! Today, July 2nd, we stripped and started resetting the Beach. 13 problems set by Me, Danny, Jake, and Lily. Joel is in Atlanta setting for SCS Junior Nationals. Connor is in California visiting his family. More problems coming tomorrow!!! Here are some videos of Joel and Jake climbing. The top one is Joel, Jake, and others climbing in the Sierras. The lower one is just Joel and shows him climbing a problem with ridiculous beta called March of the Pigs in Bishop and also Mandala Sit at the Buttermilks. Holds Everywhere! + New So Ill! We’re excited to be getting some brand new So Ill holds soon. Look for them on our walls in the next couple of weeks! 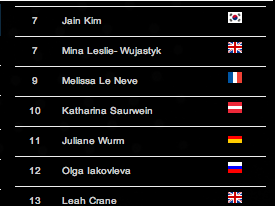 The Bouldering World Cup season has begun again. I’m probably not going to cover all the comps this season besides sharing results and some impressions, largely because it is labor intensive and now you can rewatch the live feeds almost immediately. Thanks IFSC! The first event this season was in Chongquig, China. 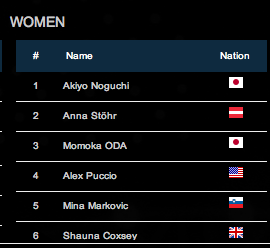 Top 3 women were Anna Stöhr (AUT), Momoka Oda (JPN), and Alex Puccio (USA). 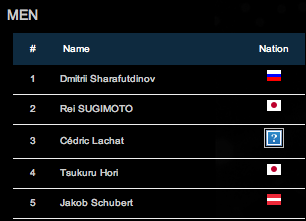 Top 3 men were Dmitrii Sharafutdinov (RUS), Jakob Schubert (AUT) and Tsukuru Hori (JPN). Nice showing for Japan and Austria with 2 podiums each, and of course Dmitrii has been very dominant the last couple of seasons for Russia. We are very proud to see Team USA climber Alex Puccio continuing to represent the USA all by herself by podiuming once again. Nice job Alex! 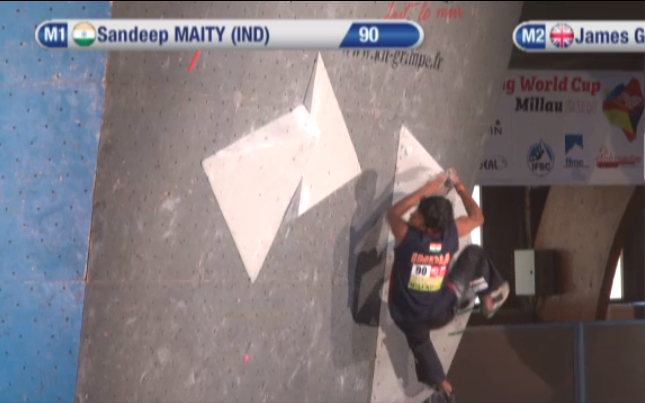 One of the first competitors from India in qualifiers in Millau. The 2nd event is in Millau, France, and is happening today and tomorrow. 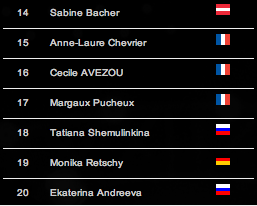 Qualifiers for women were much earlier today and men’s are just ending. The men’s problems look really hard–very powerful, also very technical/body tensiony except one which seems to be several dynos in a row–a double to pinches, a sideways to a volume, and another big move to the top. From what I saw (the last 1/4th of the field) Men’s 1 and Men’s 4 got topped out by several competitors and everyone else was getting shut down. The comments are in all languages, which is cool. 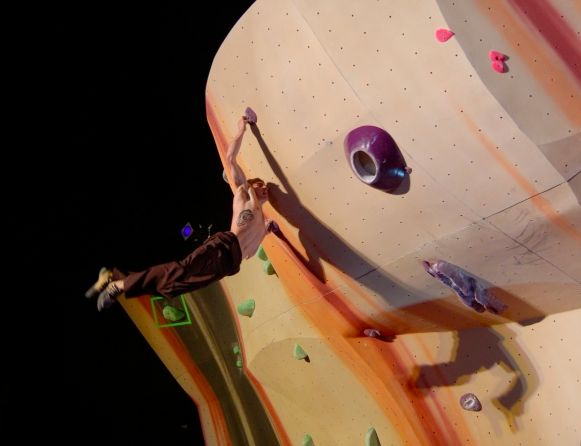 You can tell from the incoming chat questions and the announcer’s live responses that some viewers are not at all experienced with climbing or climbing competitions. 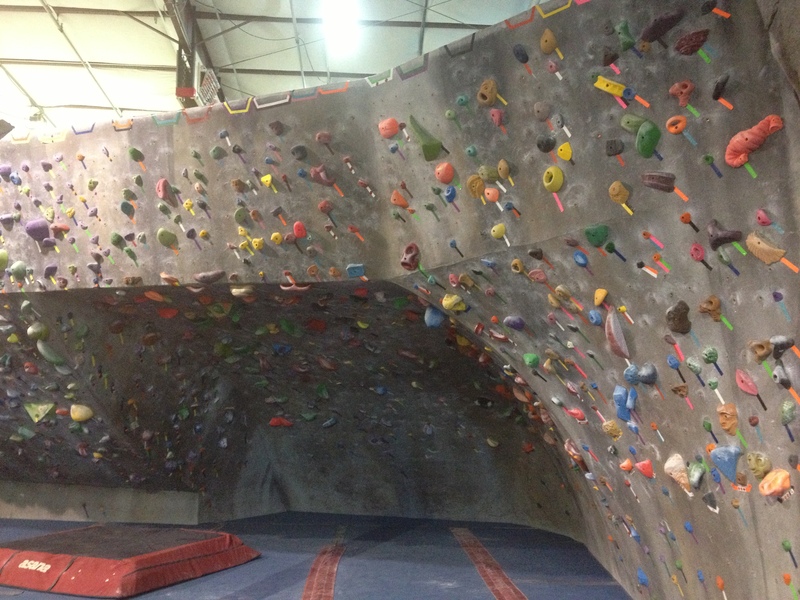 I find this very exciting–perhaps climbing is finally finding a non-climbing audience! 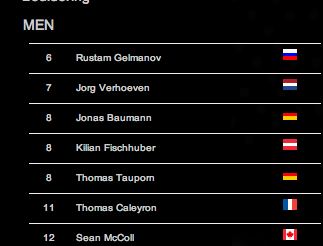 Below are the top 20 qualifier results. 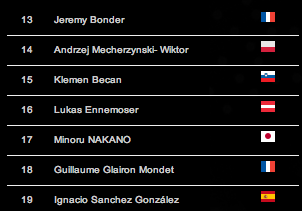 These climbers will advance to semis, so if you don’t want to know before you watch it, don’t scroll down! Semis and finals are tomorrow. Stay tuned! So that’s all for now. Stay tuned!